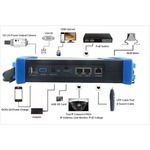 PoE, Wireless & Testers - TMHD-7006-TDR - Only $479.95! The new PolarisUSA HD CCTV tester TMHD-7006-TDR offers a wide range of features to simplify CCTV camera installations. Power, focus and aim your cameras locally without a trip back to the control room. The unit´s bright screen and easy to use menu are ideal for outdoor use. A lanyard and a hand strap are included to ease installs in locations. The TMHD-7006-TDR allows the installer to control PTZ cameras that accept data over RS232, RS422 simplex or RS485 ports. The Address Search feature can be used to run a search and determine a PTZ unit´s address. The UTP cable test feature checks for connectivity across all 8 wires and also displays the pin-to-pin connections of the RJ45 connectors. 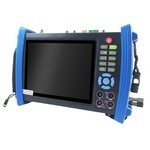 This unit is just like our TMHD-7003-MM but with the added feature of TDR breakpoint and short circuit testing!